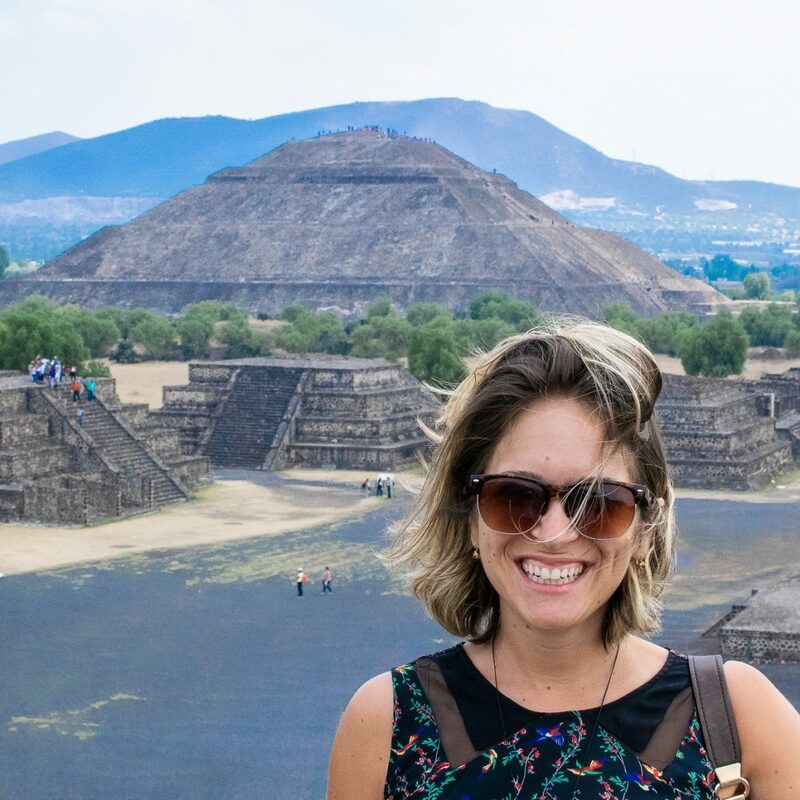 I love tacos, tortas, and tequila as much as the next gal, but when you live somewhere, you want variety. My weekends often include some combination of fish tacos, pambazos, pizzas, and/or burgers. Thankfully burgers in Mexico City are in large supply. 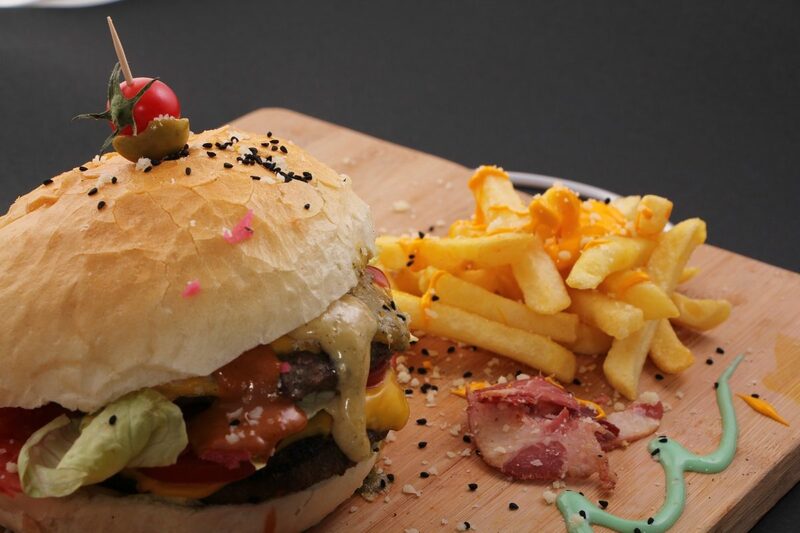 There are so many great restaurants and food stalls cooking up seriously delicious burgers. After much trial and error (not much error, I mean, it’s a burger after all), these are my all-time favorite burgers in Mexico City. Just a quick note: Since the earthquake, I have either visited these restaurants again or checked in on their social media. All on this list are safe and open for business. I freaking love Buns. It’s one of the more expensive burgers on this list, but it’s also one of the most enjoyable overall experiences. The burgers are so juicy. You have to order your fries separately. What we usually do is go for one order of fries and one order of wedges. I wish the portions were a little bit bigger, but the burger is a pretty decent size, so overall I’m full when the meal is over. Buns also has really awesome milkshakes and a pretty decent bottled craft beer selection. They also have one of my favorite IPAs on offer from the Allende brewery. It’s also in a nice quiet part of Condesa just off of Amsterdam. The restaurant is pretty wide open, so not ideal on colder nights, but during the warmer months, it’s so nice to sit near the entrance and enjoy a little indoor/outdoor seating. This is the fail-safe place we almost always end up at on a Sunday night after a few beers. 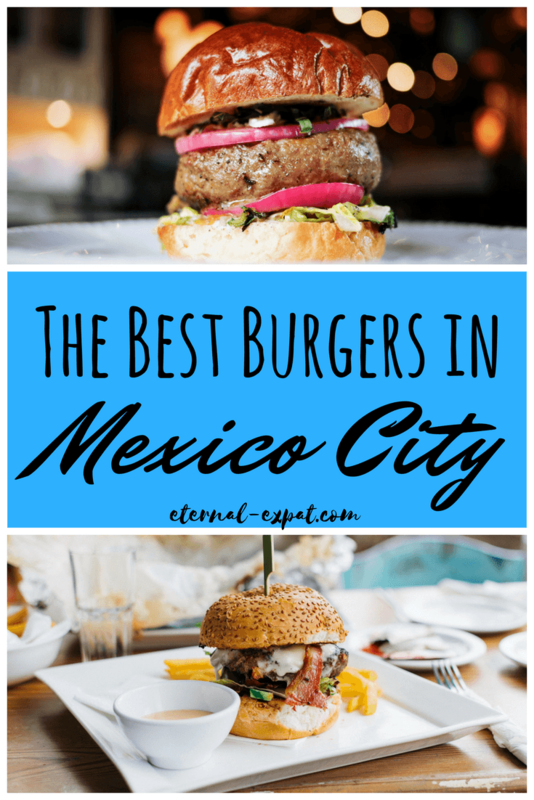 It’s really well located on Alvaro Obregon in Roma and their selection is the largest of all of the burger restaurants on this list. 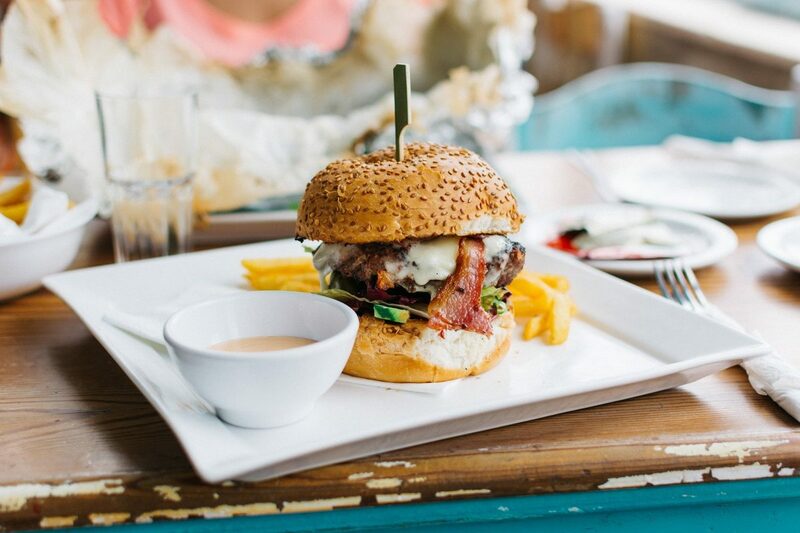 A few of my favorites are the Blue Cheese burger, the BBJ, and the Old School burger. They also serve one of my favorite Mexican craft beers on draft, Hercules. 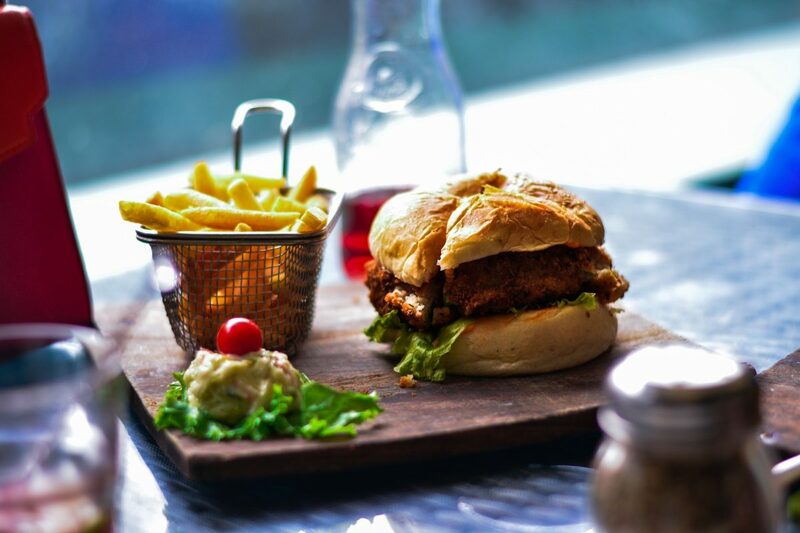 They also have a pretty big selection of vegetarian and vegan burgers and the chips come with your burger, you don’t have to get them separate. Be sure to try their house ketchup, too, it’s top class. It’s made with tomatoes, cilantro, and jalapenños. There are actually a few Chimi Burger food trucks scattered around the city (there’s one outside Bicentennial Park), but this is a stand inside the Lucerna Comedor food hall. It’s one of the best char-grilled burgers that I’ve had in the city and the portion is perfect. If you want a drink you can order a burger, fries, and a soda. If you don’t want a drink you can just order a burger and a separate portion of fries for the same price. If you do it this way, you get a WAY bigger portion of fries. Inside the food hall is also a bar, a seafood place, a pizza place, and a hot dog place. The burgers are what most people order. They have a veggie “burger” but I was pretty disappointed by it. It was basically just cooked veggies that sort of tasted like water. The beef burger, however, is absolutely delish. This boxing-themed bar and burger joint only has a few outdoor picnic tables and a few tables inside, so it can get pretty busy around dinner time. It’s worth it though. This burger is enormous. You basically just choose your base – beef, chicken, or vegetarian, then you can add whatever you want: avocado, barbecue pulled pork, eggs, chili con carne, chorizo, and even pig tongue! You do have to order your fries on the side, but they come in a huge bowl (it’s a dog bowl actually, which is weird), so one order is more than enough for two people, especially considering how large the burgers are. Although the restaurant is a little out of the way from my usual jaunts, it’s worth the walk for this burger. It’s one of the cheapest too at only 90 pesos. They also have draft beer, just the usual domestic brands, but still nice and reasonably priced. There are a few different Butcher & Sons around the city, but the ones in Roma and in the Historic Center near Alameda Park are the two that I’ve tried. There’s also one in Mercado Roma which is really popular, too. One thing I love about Butcher & Sons is the different sort of gourmet options. The pulled pork burger is divine and they do a really great vegetarian burger (so much ooey gooey cheese). I also love their gin and tonic menu. The cocktails are really flavorful and unique. Things I don’t love about Butcher & Sons: the price and the size. It’s one of the most expensive burgers on the list and also one of the smallest. It’s so delicious and you can tell when you eat it that it is seriously good quality meat. BUT almost $10 for a hamburger that doesn’t even come with fries is a little bit crazy in Mexico City. The cocktails are pretty steap too, although not too much more than you’d spend on a cocktail in a bar around Roma. 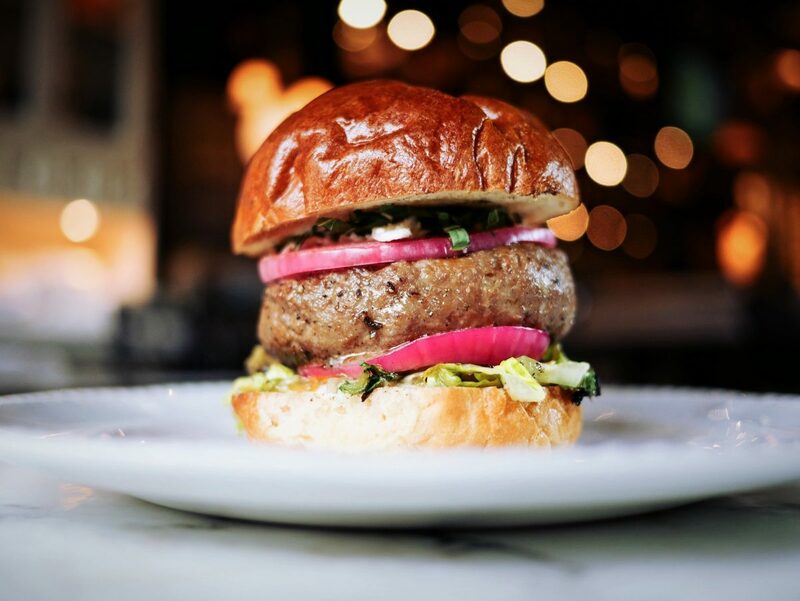 Overall, if you love a gourmet burger that is really excellent quality and want to try some unique flavors and combinations, definitely go for a burger at Butcher & Sons. This little street stall is one of the busiest street stalls I’ve ever seen in Mexico City. People literally double park and block the road to wait in line for these. Whenever I walk past, there are at least five people in line waiting for a burger. People even wait for these when it’s pouring with rain like it has been doing for the last few weeks. There’s a sort of menu, but it’s based around the topping you want on your burger. You can have a single or double and whatever delectable toppings they offer. It’s super cheap and there are no seats and no fries, but it doesn’t matter, it’s all about the burger.